The State of Texas stands today as one of the most extensive utilizers of the death penalty worldwide. Consequently, inmate living conditions on Texas’ death row are ripe for review. 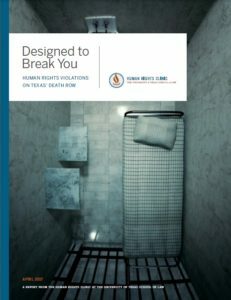 This report (download in PDF) demonstrates that the mandatory conditions implemented for death row inmates by the Texas Department of Criminal Justice (TDCJ) are harsh and inhumane. Particular conditions of relevance include mandatory solitary confinement, a total ban on contact visits with both attorneys and friends and family, substandard physical and psychological health care, and a lack of access to sufficient religious services. Investigation into these conditions reveals that current TDCJ policy violates international human rights norms and standards for confinement. Conditions on death row at TDCJ’s Polunsky Unit must be remedied posthaste. In 1999, Texas reintroduced the practice of mandatory solitary confinement for every individual convicted of capital murder. Solitary confinement involves total segregation of individuals who are confined to their cells for twenty-two to twenty-four hours per day, with a complete prohibition on recreating or eating with other inmates. An average cell is no bigger than 8 feet by 12 feet, and contains only a sink, a toilet, and a thirty-inch-wide steel bunk with a thin plastic mattress. Inmates are rarely provided with adequate blankets and often suffer from ongoing physical pain due to the mattress provided. The majority of cells include a small window, but inmates are only able to see out by rolling up their mattress and standing on it. This fact, paired with the lack of adequate outdoor recreation time, means that daily exposure to natural light is rare. Every individual on Texas’ death row thus spends approximately 23 hours a day in complete isolation for the entire duration of their sentence, which, on average, lasts more than a decade. This prolonged solitary confinement has overwhelmingly negative effects on inmates’ mental health, exacerbating existing mental health conditions and causing many prisoners to develop mental illness for the first time. In addition to the detrimental effects of isolation, the practice of setting multiple execution dates means that many prisoners are subjected to the psychological stress of preparing to die several times during their sentence. Inmates on death row experience severe barriers to accessing medical care, in part due to being housed in solitary confinement and being less able to effectively self-advocate. Inmates are not offered regular physical or psychological check-ups, and must rely on the guards to communicate and facilitate any healthcare appointments. Such requests for care are, at best, responded to within a few days, but can go several weeks without a response and are often ignored or forgotten about. In terms of psychological healthcare – an issue of great importance given that a large majority of inmates on death row suffer from some form of psychological illness – only inmates who were already taking psychiatric medication are able to meet regularly with psychiatrists. Of those inmates who are eventually given access to psychological care, they are generally only prescribed some form of psychiatric medication, thus exacerbating the unmet need for some form of counseling or non-pharmaceutical therapy. Inmates with mental illness who do not necessarily want or need prescription drugs are essentially provided with only two options: take unwanted medication, or forgo psychological healthcare entirely. Another major issue of concern is the lack of access to religious services on death row. The extent to which inmates are able to access religious text is limited, as Christian bibles are the only material available from the prison chaplain. Although Christian inmates can request such materials, they are rarely given access to ministers until the holiday season. For inmates of different faiths, such as Islam or Judaism, the situation is more difficult as they must solely rely on outside sources for their religious materials. They are provided with no access to practice their chosen faith, and are often met with contempt when seeking such access. This has created a harsh environment for inmates who do not adhere to Christianity, and has enabled a discriminatory system on the basis of religion on Texas’ death row. Next Next post: Amicus Curiae Brief filed by the Innocence Project.